The James Bond franchise embodies the American association of danger with cool, as he swaggers through life wooing ladies and killing villains while driving some of the world’s fastest, sleekest cars. These days, people walk fast, talk fast, and drive fast – but while some may argue that speed promotes efficiency, speed also increases danger. Bond makes fast driving seem cool, but in reality, speed is deadly, and signs to that effect increase driver, pedestrian, and child safety. Motor vehicle accidents cause the most deaths for children ages 3 to 14 according to the National Center for Health Statistics. School administrators, parents, and trafficofficials work tirelessly to increase awareness and education, establish safety patrols, and standardize safety signs and procedures. Their efforts significantly decreased fatality rates, butmotor vehicle accidents still account for four deaths and 490 injuries every day among American children under the age of 14. Now, drivers need to take responsibility for their actions and slow down to truly save lives. The classic Bond car: about sleek and speed. 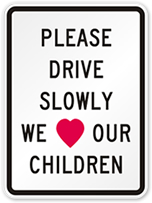 As the sign says, keep kids safer by driving slower. With the introduction of the car, child fatality rates spurred American safety officials to adopt safety patrol programs. As early as 1926, public safety officials published results of their trial safety programs in The Sign Post by Lyle Culvert & Road Equipment. In Oregon, the Portland Electric Power Company initiated a program that elected and trained safety officers from each school in proper crossing etiquette. Backed by the local police, these safety officers would guide children across the street, eliminate street play, and report automobiles that failed to stop at school stop signs. After only three years, the program reported significant decreases in incidences of student injury accidents, despite increased enrollment. In 1925, Portland schools reported only 75 accidents for its 48,000 students, compared to its previous 165 accidents with 38,000 students in 1922. Other cities such as Philadelphia, Omaha, and Seattle soon implemented similar programs and reported similar findings. Besides safety patrol programs, public safety officials also launched various educational initiatives to teach children the importance of street safety. Phillip Lewis, Philadelphia’s Supervisor of Safety Patrols, asserted that childish play instincts, bad habits, and ignorance cause a majority of children to run into the streets unawares and get hit by passing cars. As more safety officials began to adopt Lewis’s beliefs, schools initiated more programs to teach students about road safety. Teachers taught students how to assess and react to dangerous situations while crossing the road through various mock exercises. Watch Out for Kids warning from the 40’s. This classic symbol has remained a powerful symbol of a child that could potentially gallop in front of you. See both a 1950’s and a modern version of the same sign. Nowadays, the National High Traffic and Safety Administration (NHTSA) distributes materials to schools across the nation on pedestrian safety. Children grow up learning to look before they cross the street. Unfortunately, many children still display difficulty accurately judging the speed and distance of moving vehicles even after their training. As a result, children may unwittingly put themselves in harm’s way. Children will be children, but society seems to expect children to act like adults. Adults and drivers need to take responsibility for their actions when they hit children instead of blaming the children and their parents. Simply slowing down in school zones and neighborhoods can help decrease the incidence of accident. The NHTSA reports that 5% of all hit pedestrians die when hit by cars traveling under 20 miles an hour. Every 10 mph speed increase augments the chance of death– 40% of hit pedestrians die at 30 mph, 80% die at 40 mph, and 100% die at 50 mph. Slowing down also gives drivers extra time to react to potential hazards such as a child chasing after a ball in the road. Yet, traffic officials and citizens alike still protest the installment “Child at Play” and “Slow Down” signs. Signs like this one warn drivers when they're coming up on frequented sites, like the roads around a park or a school. 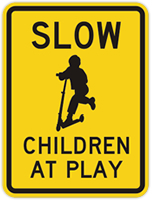 Officials and citizens believe that these signs fail to effectively address any issue at all, and in fact, unwittingly promote the idea of children playing in the streets. Dissents assert that “parents should supervise their children”, “children need to stop playing in the roads”, or “parents should enforce stricter road safety rules.” They cite these reasons against child-at-play signs, but no conclusive evidence proves any of these sentiments true Regardless, studies on warning signs prove that in limited quantity and when used appropriately, warning signs effectively decrease crash rates according to the Minnesota Department of Transportation. Signs can only influence the driver. The driver must make his or her own decision to slow down. Since the beginning of traffic regulations, drivers have made conscious decisions to ignore warning and traffic signs at their own risk. The evolution of the Manual on Uniform Traffic Control Devices (MUTCD) since 1935 outlines the change in school crossing signs and procedures. Originally, very few procedures in the manual dealt directly with school crossings or even pedestrian crossings. In 1971, however, the MUTCD created an entire section devoted solely to school traffic signs, especially school crossing signs. This movement indicated the first major move by traffic and highway officials to solve the issue of child pedestrian death. With recognition by the department of transportation, child fatality rates dropped significantly. Regulation, education, and procedure helped decrease the death toll to its current range. Nevertheless, the death rate remains too high for a modern nation. 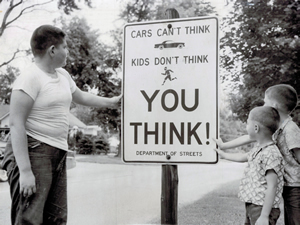 Cars and kids can’t or don’t think! 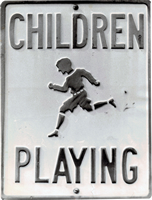 In the 50’s a range of novel Child at Play sign legends were tried. These two cut-out signs predated the modern child and pedestrian signs now common on school crosswalks. Signs that are “in the street” are particularly effective. At this point, drivers must slow down to save lives. Society needs to hold motorists accountable for their actions, rather than pointing the finger at the child that runs after a ball. Children, parents, educators, and safety authorities have already made countless efforts to decrease the incidence of tragedy. Now the rest of society must get on board. Drivers need to realize the severity of the problem and take responsibility for their actions. Make America’s roads safer: drive slower.